Will My Child Learn Green Chemistry? Every other week my seven-year-old goes with his buddy after school to ‘chemistry club’—meaning they spend an hour with a retired science teacher who taught in various schools for 40 years. 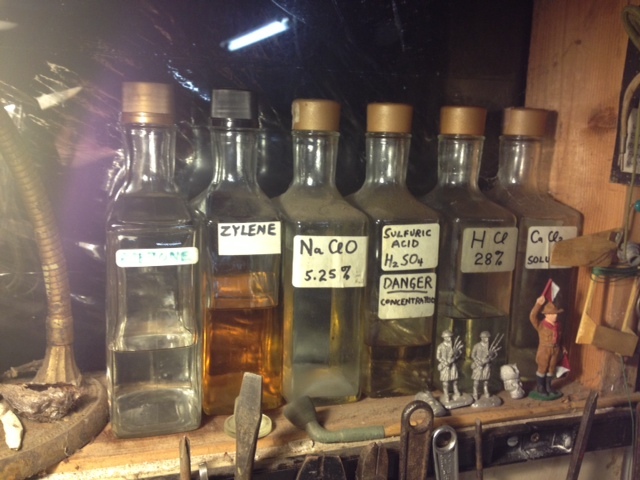 His “lab” is something out of the early 20th century, complete with rows of dusty bottles with handwritten labels noting specific chemicals or simply “danger”, wires and gadgets that cover shelves and spill out of boxes, and an antique wood stove that never quite gets the room warm. He introduced the periodic table on the first day, and since then, has shown them everything from electromagnetic fields to explosive chemical reactions. The boys love him, even though he shifts quickly from one experiment to the next and gives them information that I recall not learning until at least high school. Given the 20 years I have worked on environmental health issues, I observe this class both with exhilaration—watching these young kids get excited about learning how the world works, and with discomfort—wondering if they are protected enough from hazardous exposures, knowing all too well what certain contaminants can do to undermine healthy development. This letter was originally published in the Pittsburgh Post-Gazette. It’s republished here with the author’s permission. Imagine all the chemicals used in televisions, computers, upholstery, car seats, building materials, even children’s pajamas. Imagine that some of these chemicals migrate from products into dust and dirt, and build up in our bodies. They are found in the cord blood of newborns and in breast milk. Imagine that these chemicals are similar in structure to the notorious PCBs – carcinogens banned from use in the late 1970s. Now wouldn’t you also imagine that these chemicals were tested and found to be safe to human health before they were allowed into our products and homes? Polybrominated diphyenyl ethers are flame retardant chemicals that persist in the environment and build up in the food chain and in people. Laboratory studies link exposure to PBDEs with lowered IQ and attention problems. This summer, a study of pregnant women found that those with higher levels of PBDEs had reduced levels of thyroid hormone, which is essential to a baby’s brain development. But despite growing scientific evidence linking toxic chemical exposures to serious disease and disability, our government does not require that PBDEs – or any of the other 80,000 chemicals on the market – be tested for effects on human health. That could be about to change, and two Pittsburgh members of Congress are in key positions to help make it happen. With epigenetics on the cover of Time magazine this week, public awareness of the links between our genes, our environment and our health has never been so widespread. Throughout history, breakthroughs in understanding have been largely shaped and guided by the questions we choose to ask. After World War II, the questions most researchers as well as policymakers in the U.S. were asking focused on how to build infrastructures to catalyze the growth of large-scale industrial processes and products – from pesticides to plastics to pharmaceuticals. The underlying assumption was that we could improve on nature without necessarily understanding or abiding by the natural principles that have allowed life to be nourished and sustained for the previous tens of thousands of years. In just the last generation, however, new and pressing questions have begun to emerge. For example, why – with the vast availability of food products, abundance of sophisticated technologies, and myriad advances in medicine – are more and more people facing chronic diseases and other health problems in the U.S. as well as experiencing a lower quality of life? Why – if being successful means driving bigger cars and having bigger houses – would we be seeing glaciers melting at unprecedented rates and millions of new climate refugees? Clearly, we can no longer delude ourselves that ‘improving on nature’ is predicated on disregarding it – and instead, ask how can we work within the systems and imitate the processes that have made this planet life-sustaining to date? Fortunately, there are more and more researchers and others who are asking just that, and perhaps none more energetically than those in the increasingly robust field of green chemistry. Just a couple weeks ago, Paul Anastas, PhD, who is considered by some ‘the father of green chemistry’, was finally appointed Assistant Administrator of the Office of Research and Development at the EPA. For some years now, he and other colleagues – including many of you – have suggested that a number of the major problems we see today, such as the adverse health consequences of toxic exposures and climate change, are in large part due to not asking the right questions in the first place (or perhaps, as some would argue, there were simply too few people in power asking those essential questions). By contrast, those in green chemistry are urging us to ask a set of principled questions before creating new products and technologies, so that, ultimately, the trajectory of our choices can be as biologically and ecologically benign as possible. This month CHE is hosting or co-sponsoring three national/international calls that are intended to help us ask better questions so that our pursuits can be more in keeping with the natural systems in which we have evolved and in which future generations will live. The first is a CHE Café Call with Elizabeth Grossman, author of the recently published book Chasing Molecules, which describes how green chemistry has the potential to not only lead to safer products and materials, but reduce the health impacts of climate change. The next is a CHE Partner call on the potential health impacts of chemicals that can disrupt thyroid dysfunction and how chemical policy reform can help address these concerns. And the third call will be co-sponsored with SeaTrust and IGI and feature two colleagues working at the intersection of climate change and health and attended the recent Copenhagen climate change talks. For more information on these calls and how to register, please view the left-hand column on CHE’s home webpage. I truly look forward to collaborating with you in the New Year in order to hone our capacity to get the questions right as we work towards a healthier tomorrow.